Lawmakers in Cyprus have rejected government plans to impose an unprecedented tax on bank deposits, throwing into doubt a €10 billion euro bailout agreed with the European Union just three days ago. Failure to secure emergency loans from the EU would leave Cyprus facing a banking collapse and default. The bailout, while small compared to the rescue packages for other troubled EU nations like Greece, represents more than half the size of the €18 billion Cyprus economy. 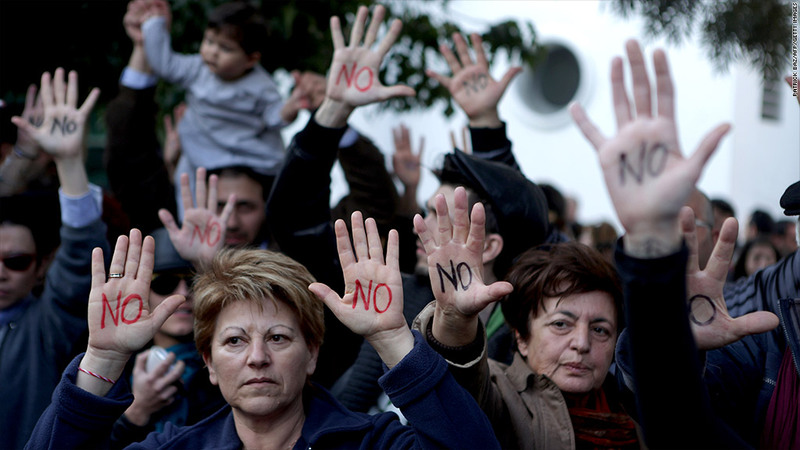 The proposed tax on deposits, unprecedented in a eurozone bailout, led to a run on cash machines in Cyprus over the weekend, sparked big protests outside parliament and shook financial markets Monday. Officials had made changes to the proposals to protect depositors with less than €20,000 euros in their accounts, but plans to levy a tax of 6.75% on deposits of €20,000-€100,000 and 9.9% on anything above €100,000 proved unacceptable to parliament. The party of President Nicos Anastasiades, who negotiated the deal with the EU, abstained. In response, German Finance Minister Wolfgang Schaeuble said on German public broadcaster ZDF that European officials "regret" the vote by Cyprus rejecting the tax. "Cyprus has a banking sector that is way too big and they are insolvent with that model and no one outside of Cyprus is at fault for that," Schaeuble said. "This business model is not sustainable, there is no alternative." The official response from Eurogroup President Jeroen Dijsselbloem was terse. He said the Eurogroup "took note" of Tuesday's vote but stood by its position that any rescue plan would come with strings attached. In Cyprus, the banks will remain closed until at least Thursday. Unable to function without the services of the banking sector, the Cyprus Stock Exchange has announced it will stay closed as well. ATMs were still functioning, according to CNN reporters. The most controversial provision of the bailout was the tax on deposits, which are protected in Cyprus, as in the rest of the EU, to a level of €100,000. As compensation, depositors would have been offered bank shares, underwritten by income from as-yet undeveloped natural gas deposits in Cypriot waters. Cyprus was reluctant to increase the levy on larger amounts. It feared it would scare away international investors drawn by its low corporate tax rate and open economy -- in particular, Russians who hold as much as a third of the country's bank deposits. The country first asked the EU for help last June. But talks were hampered by the reluctance of a previous government to accept terms, and also by EU concerns about money laundering. Russia has come to Cyprus' aid in the past, providing a €2.5 billion loan in 2011 to shore up government finances. But its participation in the new rescue was looking uncertain after President Vladimir Putin attacked the tax on bank deposits as "unprofessional and dangerous". A finance ministry spokesman said Russia was reviewing its position after not being consulted on the decision to impose the levy. Cypriot Finance Minister Michalis Sarris was traveling to Moscow for talks on Wednesday. Cyprus is the fourth of 17 eurozone states to be granted a bailout by its EU partners and the IMF, after Greece, Ireland and Portugal. Spain has been given EU assistance to rescue its banks, but has so far avoided asking for a full sovereign bailout.